So there I was, looking at this pile of ashes I call my life; when I started to see these unfamiliar, unexpected pieces lying underneath. And I thought to myself, "What are those? And what in the world am I supposed to do with them?" It's strange because I thought I knew all the pieces. I thought I'd taken proper inventory. I thought I had, but there they were – residues of truth waiting for me to uncover. This is all metaphorical, of course, but there's a lot of truth in it – years of chronic illness and trauma; years of misdiagnosis and loss; years of suffering and pain; years of working to recover. Some of this is better and some is still an ongoing work. And perhaps, to some degree, it will remain a work in progress. I've always tried to see the positive – the proverbial silver lining – in things despite the challenge or adversity. I've always looked for the blessing in disguise. I have always had this inner drive that when the going gets tough, the tough get going - and those are good things; the right perspective and attitude are important. I've also developed a deep trust in the Lord and His timing, taking things to Him in prayer, which helps keep me grounded and rooted in Him and His promises; this is important too. Still, one has to take a long, hard look at the truth of their lives and get real. So as I've spent many of these years getting to know Him more intimately, continually learning, growing, and being trained in the things of God and His Kingdom, all while working to find answers and heal, I've also discovered those aforementioned pieces I didn't know were there; places I'd not given Him access to because I didn't know they even existed, but now I do and we're working on them together. Through it all, I have learned His presence in our places of deepest pain is how true healing begins. He shows up in our struggle. 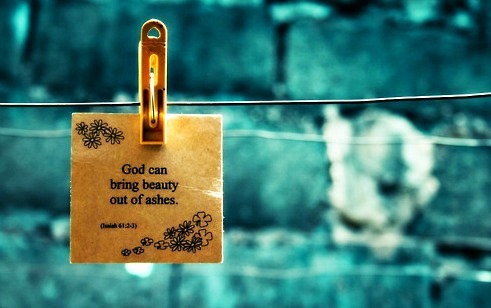 He shows up in our heartache. He shows up in our anger. He shows up in our fear. He shows up in our secrets. He shows up in our numbness. He shows up in our scars. He shows up in our despair. He shows up in our doubt. He shows up in our mess. He shows up in our disappointment. He shows up in our brokenness. He shows up in our story. He shows up in those unexpected places. He shows up at unexpected times and in unexpected ways and when He does, we wrestle. We wrestle with every "Why?" that we carry. We wrestle with silence and unanswered prayers. We wrestle with bruises from the past and the present. We wrestle with suffering, injustice, and not understanding. But this is also when His grace and truth begin to dissolve our barriers, defenses, and illusions. That's when His love and compassion begin to invade the innermost crevices of our hearts. That's when His light and hope begin to spark something fresh and new within us. It is often a process that involves our personal willingness and participation but it's one that eventually leads to genuine transformation. And it usually involves the people and the pieces He's chosen to be a part of our healing journey. Let me add that this process doesn't happen just for the sake of it happening. Jesus isn't only interested in results or a good outcome although He cares about such things. His greatest interest is in us and the condition of our hearts because He knows heart issues hold the key to how we function in life. He knows waving a magic wand over our problems and making them instantly disappear isn't the remedy we need. He's most interested in healing the things we don't always understand or even realize are in need of mending. He's interested, not so much in our ongoing personal comfort, but in the state of this "heart," which is the source or wellspring of our whole lives. He knows what we are in need of, even more than we do. Therein lies both the wisdom and the mystery of the transforming nature of Christ. In transforming us, He transforms our pain. And that is the ultimate exchange of beauty for ashes. It's quite a holy work. Renee, thank you for sharing this with me. I don't take it lightly. If I could reach right through this screen and give you a hug; I would. Lifting you up to Him. God bless you too, friend.